Dubai-based Syrian billionaire Ghassan Aboud plans to invest $100 million into a new hotel and residences at Port Douglas after snapping up the Reef Marina at the northern Queensland destination. The investment – through Crystalbrook Collection, the hospitality arm in Australia of Mr Aboud’s GA Group – will be the fourth development in Queensland for the group. The marina was bought, at an undisclosed price, from former Macquarie banker Andrew Hooper-Nguyen and his business ­partner, the co-founder of Excel Coal, Chris Ellis. The pair, both keen boaties and counter-cyclical investors, have made a speciality of rescuing under-loved marina assets, having previously acquired Spinnaker Sound Marina at Deception Bay in Queensland. 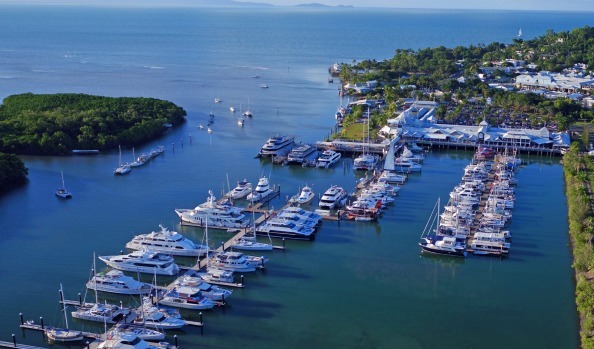 The acquisition of the Port Douglas marina and the proposed development will take Mr Aboud’s exposure to around $500 million in Queensland hospitality assets. The group is a targeting around $1 billion in investment in all. At Port Douglas, the group intends to expand the facility further to accommodate more superyachts, adding another 24 berths berths to the existing 132 berths to cater for yachts of up to 50 metres in length. A luxury 100-room hotel is also planned for the waterfront, along with 50 premium residences and further retail and dining areas. “With our plans, we believe we can redefine the Australian marina experience and ensure Port Douglas is an essential-visit location for high-end global travellers,” Mr Aboud said. The group already has three hotels in Cairns under construction with an investment of more than $370 million. When Mr Hooper-Nguyen and Mr Ellis took over the Port Douglas facility, formerly the Marina Mirage, in December 2013 it was in very poor condition. The boating enthusiasts identified the turnaround potential for the marina, where 350,000 people visit the each year to embark on trips to the Great Barrier Reef. Under their hand, a super-yacht extension was added, the retail complex was refurbished and development approval was gained for 85 luxury townhouses and apartments. “Our strength is in turnaround and operation of marinas,” Mr Hooper-Nguyen told The Australian Financial Review. “Whereas not long ago the marina was literally falling apart; today it is a superyacht hub featuring world class entertainment venues. “Having obtained approval for the redevelopment of the site, it is appropriate to pass the marina onto an experienced developer.